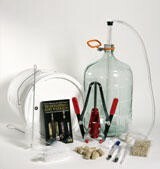 Our Premium Winemaking Equipment kits come complete with everything you will need to get started whether making wine from Ingredients kits juices and or concentrates. NOW INCLUDES A WHIP DEGASSER! Recommended additional equipment not included Stirring spoon.